Two of the most important tools when talking about combating a wet or leaky basement are sump pumps and backwater valves. These tools are essential in keeping your basement dry. Sump pumps re-direct water away from the foundation of your home to an exterior location. Backwater valves are devices that stop outbound from the house from re-entering the home through the drain pipes in the event of an intense storm. There are three main features to the device: a tank that holds water drained from the weeping tile, a pump that pushes the water out of the basement, to a non-problematic area away from the house, and a battery back-up system and alarm, further peace of mind in the event of a power blackout. A sump pump is a key part of an interior waterproofing/weeping tile system in your home, something we recommend highly to all our clients. If the water table is high for example, you might be in a situation where water builds up below your basement floor, or through cracks in the wall or weak points between the floor and foundation slabs, overwhelming the weeping tile system, causing water leaks into the basement. The sump pump protects the homeowner against all of this.  Call Canada Waterproofers Brock for a free onsite waterproofing assessment of your home. We are the top waterproofing contractors in the business! Have a wet or leaky basement? We have your back! The crews at Canada Waterproofers Brock will excavate, remove and dispose of the soil, and install a water tank (also called a sump liner). Next step is to set up a connection from the existing weeping tile (or the new weeping tile, if installed) to the side of the tank. Our technicians will then encase the tank with gravel (3/4” clear), re-cement around the tank, install a submersible pump, then test the system (discharge water to the exterior). If all checks out and meets our high standards, we’ll put a lid on the tank, bolt it down, and you are good to go. Good to have in place, if the power goes out – a common occurrence during a nasty summer storm. This is a separate pump that runs off a marine battery, so it will automatically turn on if the power goes out. It will run for up to 24 hours units own. The water-powered pump is a great device – since you don’t need power to run it. Water turns the pump turbine, which then pumps water out of your basement. With this pump there is no time limit as to how long it will run. Ask the waterproofing contractors at Canada Waterproofers Brock to explain these back-up systems in more detail. Ever hear of the scenario where the city sewer system gets overwhelmed during a storm and sewage and water backs up through the pipes into neighbourhood homes? Municipalities and insurance companies now recommend highly that backwater valves be installed in the homes. New homes likely already have them installed. A backwater valve is a device that prevents outbound water from the home to re-enter through the home’s drain pipes. Canada Waterproofers Brock understands that a flooded basement can be extremely stressful and cause a massive upheaval in one’s life. It can be a very expensive issue to fix. Talk to us about taking the right precautions – including technologies alike sump pumps and backwater valves. Call Canada Waterproofers Brock for a free assessment of your home.